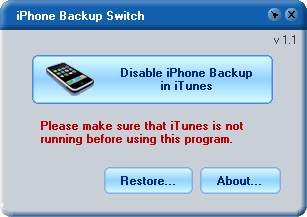 The small utility able to turn off and on the backup functionality in iTunes calls iPhone Backup Switch. As mentioned in its name, it is provided for the iPhone users; however it should work with iPod Touch players too. I tested turning off the automatic backup with my iPad, iTunes and Windows 7 – and it work too. And why you should think about turning off the backup and sync process in iTunes when the automatic backup is very useful feature for you iPad, iPhone or iPod Touch? Simply, you may want to use these devices only as the external backup storage connected via the USB. Another reason could be insufficient disk space on your computer. If you think it should be useful for you, download the iPhone Backup Switch. After the application starts, click the Disable iPhone Backup in iTunes button. Make sure the iTunes are not running before you will click this button. Then try to connect your iPhone (or iPad). If you would like the backup functionality back, just close the iTunes, run the iPhone Backup Switch and click the Enable button.